I hope everyone is having a great weekend so far. 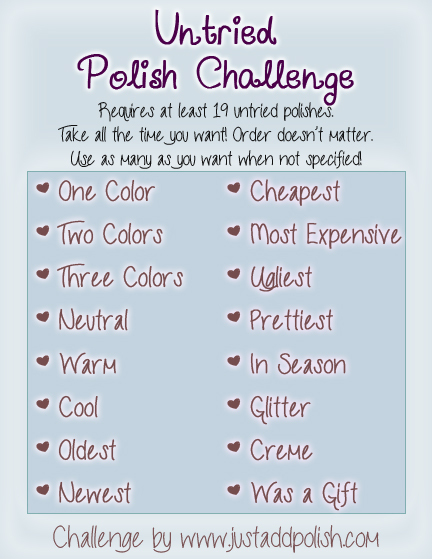 Usually I only post on the weekdays, but recently I agreed to participate in a polish challenge. Eek I know! 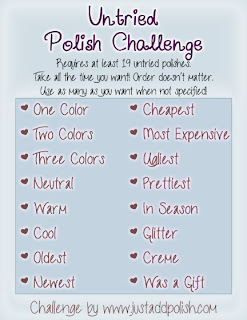 Jonochi over at Just Add Polish came up with the idea to do an Untried Polish Challenge. 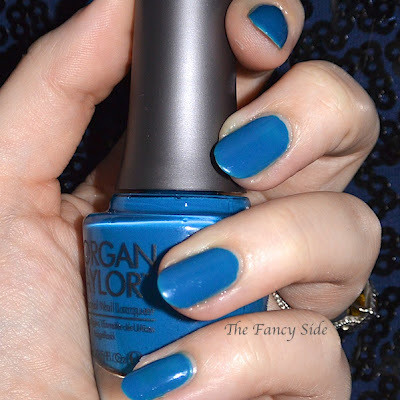 The challenge calls for at least 19 untried polishes, and I have at least that many. Today is the first day in the challenge and then every third day from here on out. Below you can see the Challenge Schedule. 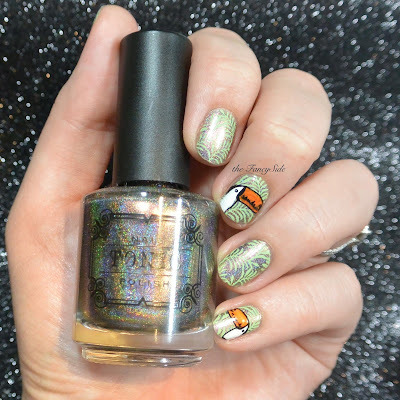 I'm defining untried as hasn't been featured on the blog. Granted most of them will still be "untried" in the truest sense of the word as well. 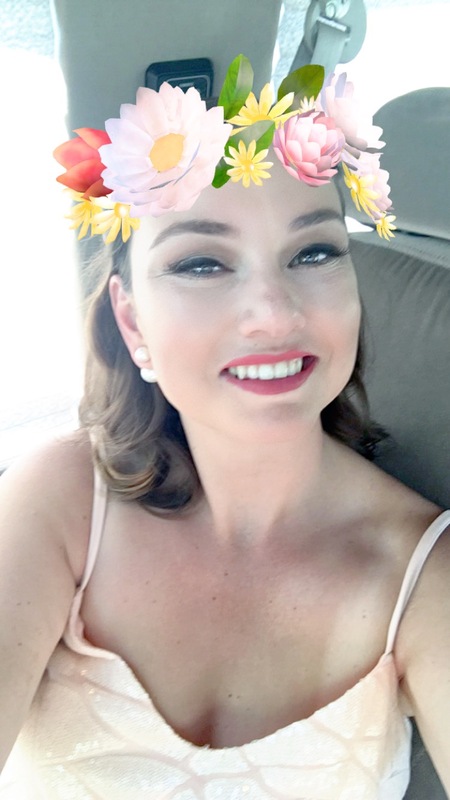 As an added challenge to myself, I also want to try new techniques as well, so look for those within the challenge as well. So for today, we have the One Color post. I decided to go with a pretty purple I've had sitting untouched for to long. I give you Anemone of Mine. This is a dark purple with red leanings. Kind of a beet type color. Anemone of Mine is by Sally Hansen Complete Salon Manicure. I really do love this brand. 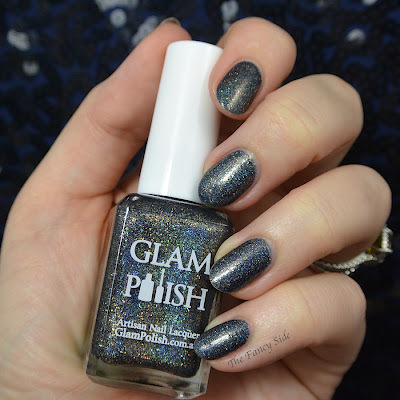 For drugstore polish, I've never had a single issue with any of the ones I own, and boy do I own a lot of them. Thanks! I'm so excited to be doing this with all of you ladies. Can't wait to see what you come up with over the course of the challenge. That is super pretty! 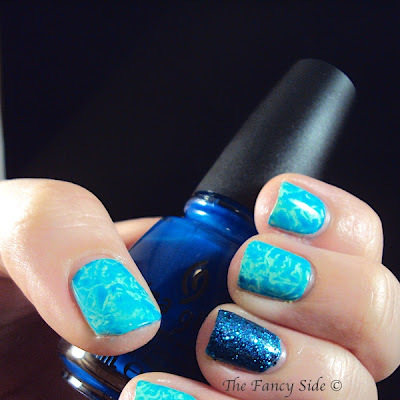 I've never tried that particular type of Sally Hansen polish, but I have an untried one laying around. This has inspired me to bust it out! Thanks. I actually do own a lot of these and for a drugstore brand they haven't let me down yet. 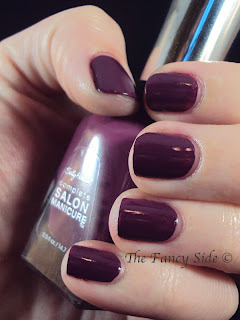 This is lovely :) I love a good purple polish! Thanks!! I do too. I don't ever wear them enough though. I need to put them in rotation more often. I really really want a zig a zig ahh..